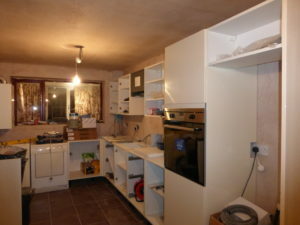 We were contacted by a previous customer requesting a kitchen fitting in Stretton on Dunsmore, near Rugby. You can follow the progress through each stage with the images below. 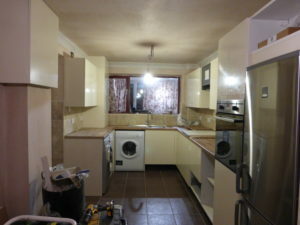 The kitchen was installed in around 1993 and needed updating. We have worked closely with the customer to come up with a plan that works in the room. 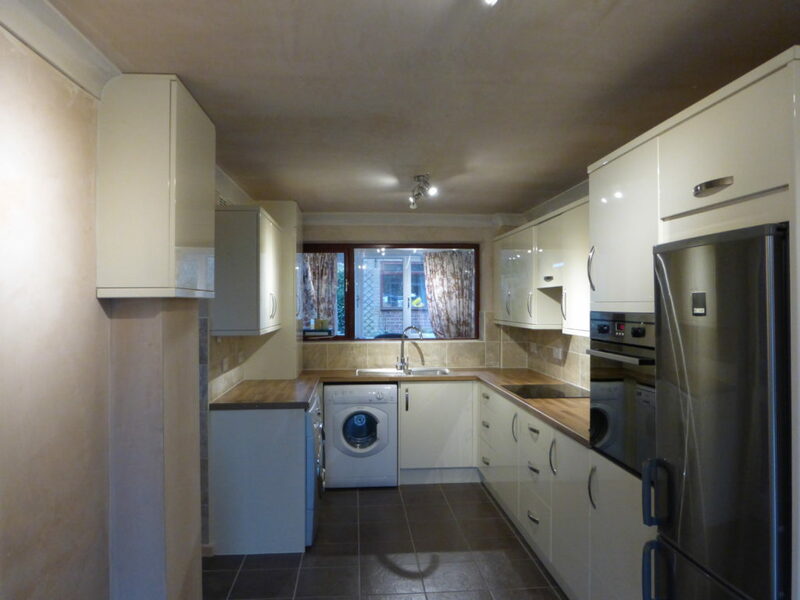 The requirements by the customer were to make the room look light and airy, have as much storage space as possible, include a built in cooker at eye level, hob, dishwasher, washing machine, tumble dryer and fridge freezer. The following photos were taken at the start of the project. 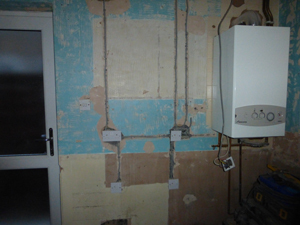 Day 1 – Due to a previous leak in the bathroom above some of the ceiling needs replacing. 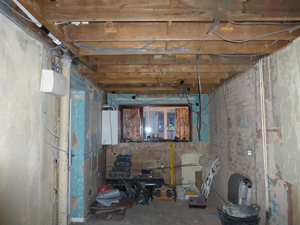 After removing the ceiling it has been discovered that the room needs to be rewired, which will delay the completion. On further investigation the wires in the house are all old style cables, an extension on the property has not been connected correctly and there is other wiring which is dangerous. 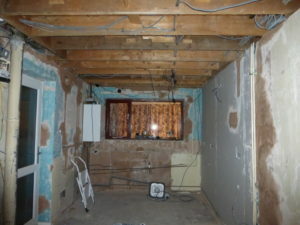 The customer has agreed a complete rewire, which is easier to complete before the ceiling is replaced. 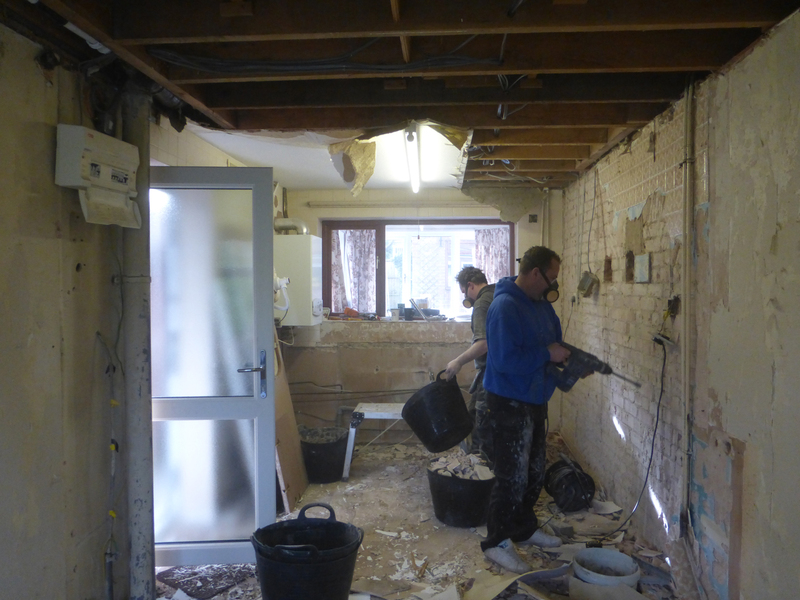 Day 2 – So that we do not get too far behind on the fitting of the new kitchen, we are trying to prepare the kitchen ready for the walls to be plastered. All the sockets are marked out and chisseled out. The wire is then installed ready to be connected to the circuit board which is in the same room. 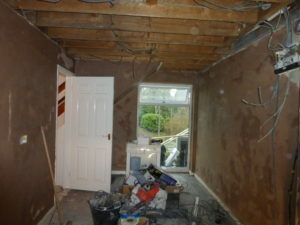 All the old plaster is also removed from the walls so that new plaster board can be fitted. 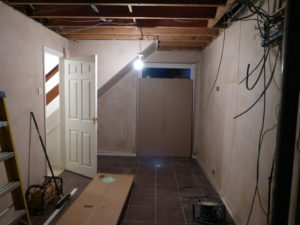 Our specialist team member completes all our plastering, leaving fantastic smooth results and completes the task fast. While the plastering is being done the rest of the team continue the house wiring, adding new sockets, light switches and fittings. Ali is our expert tiler and has been part of the team for many years. At this stage, only the floor tiles are fitted, ready for installing the floor standing units. 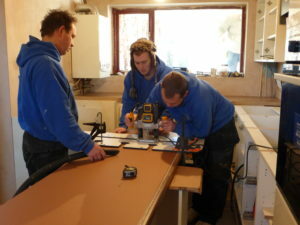 The Kitchen units come flat packed from the supplier. They all need to be built before fitting. Choosing a good quality strong unit is important for the final finished room. At this stage, both the floor and wall units are installed. 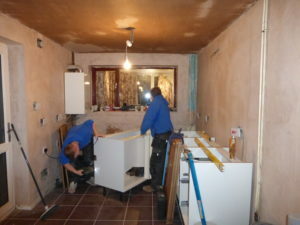 Once the kitchen units are in place, the appliances can be installed. 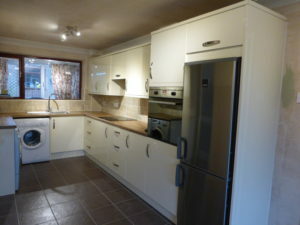 In this kitchen, the customer has chosen freestanding, but fitted appliances can be used. 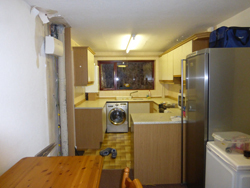 The room is small, so a space saving dishwasher is fitted. 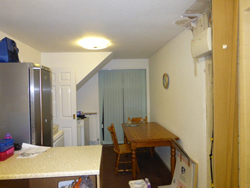 The oven is integrated into full height units so that it is at eye level. To get a good finish on the joins of worktops, we use a router and template to give us a smooth curve. The finished fitting looks better than the standard square connection. 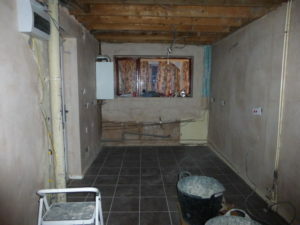 Once all the units and worktops are in place, the walls are ready for tiling, again by Ali. The wall tiling is complicated due to having to go round windows, sockets and the height, nearly every tile needs to be cut to shape. The final stage is where our eye for detail plays an important part. 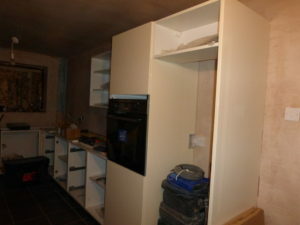 The unit doors and drawer fronts are fitted along with all handles. The electrical sockets get screwed into place. Our last job is to clean everything and ensure that our work is up to a high standard that our customer expects. We have fitted many kitchens throughout Leicestershire and Warwickshire including Stretton on Dunsmore, Ryton, Coventry, Stoney Stanton, Leamington and Warwick. Return from kitchen fitting Rugby to Creative Design Kitchens.